My adventure to the Middle East started in Kuala Lumpur where I took the six-hour flight. I was fortunate that I was able to find a row of vacant seats at the back of the plane where I took a good four-hour sleep. It was one o’clock in the morning when we touched down at the Abu Dhabi International Airport. Before I presented my passport and visa paper at the immigration check, they requested me to get an iris scan. After an hour of waiting at the free internet shop at the airport, my host Julita Ruiz, a former college classmate with her hubby Manny picked me up with a taxi at the airport. We warmly greeted each other. She was the one who sponsored my tourist visa in the UAE. The temperature was cold at 15 degrees centigrade. They took me to their apartment where we had a good talk. They share one subdivided room with another couple and pay an expensive rental fee. This is how the housing works in the city. Since many workers are now migrating to the city coming from Dubai with weakening economy, they tend to over populate an apartment to reduce the monthly rental fees. Abu Dhabi is the capital and the second largest city of the United Arab Emirates. According to CNN, it is the richest city in the world because of its prolific oil business. It has an area of 67, 340 km2 with a population of 860,000. This emirate is ruled by Sheikh Khalifa bin Zayed Al Nahyan, the second president of UAE and son of the first president of UAE Sheikh Zayed. Its name was derived from zaby, an antelope or gazelle and the name was first used 300 years ago. I was taken around by Juliet on my first day then took me to the restaurant called Taza. Taza means fresh where I got a full meal of chicken and my first time to eat the kubus, the Arabic bread. I noticed that there were lots of car parked not only on the side streets but also in the center. There’s a lot of Pinoys working in the city. I noticed that they were snobbish which I presumed to be influenced by the locals. Local Arab women are paranoid over taking photos in which I experienced taking a shot of the sunset where I stood opposite the street and the cars stopped for the traffic light. There was a lady on the car who screamed out. She might have thought that I was taking a picture of her. I just ignored her and shied away. That issue could also lead to imprisonment if it’s proven true. I walked the whole stretch of the Corniche Beach ending up to the Marina Mall. It was quite a long walk that my foot got ache. I have seen some Pinoys and other nationalities fishing. Caucasians were playing volleyball on the sand. I rode the public transport in the city and the charge for one way fare is one dirham. There is a separate section usually in the bus for all of the women passengers. 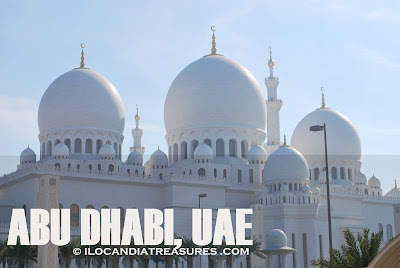 I visited Sheikh Zayed Mosque as the highlight of my trip to Abu Dhabi. When I went back to the city from Dubai, I had dinner meeting with Nooh, a local friend whom I had worked with in Japan for an exchange program. He spent only an hour because he was having a graduate class. Immediately after that I had another dinner meeting with Freddie Pacleb, my elementary schoolmate who works for the Royal family and he related his experiences working with his prince boss. Nice post, thanks for sharing this news about the richest city in the world.